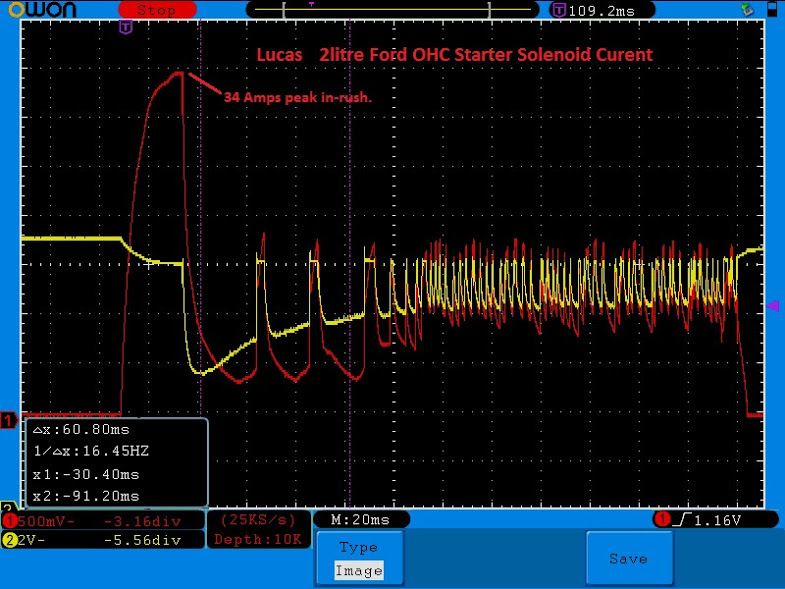 Choosing your first Oscilloscope is a big step, if you have watched Paul’s videos even if have never used an oscilloscope you will know it is a very sensitive voltmeter that draws a graph. 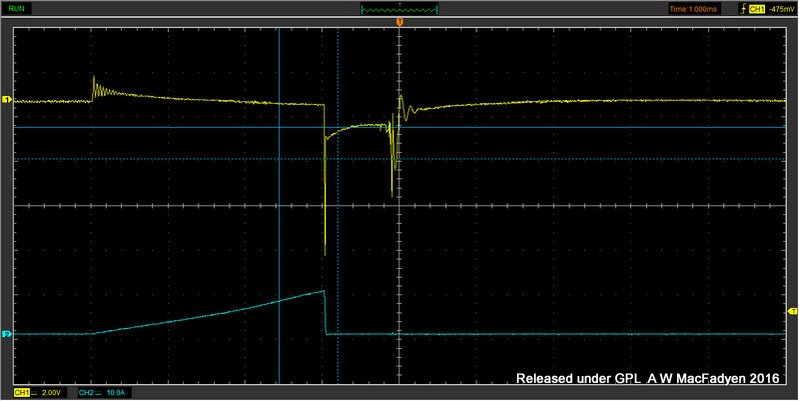 Because it works very fast an oscilloscope allows you to capture in fine detail picture of events like an ignition spark that happen in less than 1/1000th of second. All modern oscilloscopes use some form of computer to process the signal you see on the screen, the processor can be built into the unit as on the AESwave Uscope or done by software loaded on to a notebook or desktop computer as on the Pico scopes. If you have watched Paul’s videos you will know Snap On (and increasingly other high end tool manufacturers) build oscilloscopes into plug-in diagnostic tools. Snap On and Pico are of top end of the automotive oscilloscope market. However you don't need to spend a huge pile of money to get started. 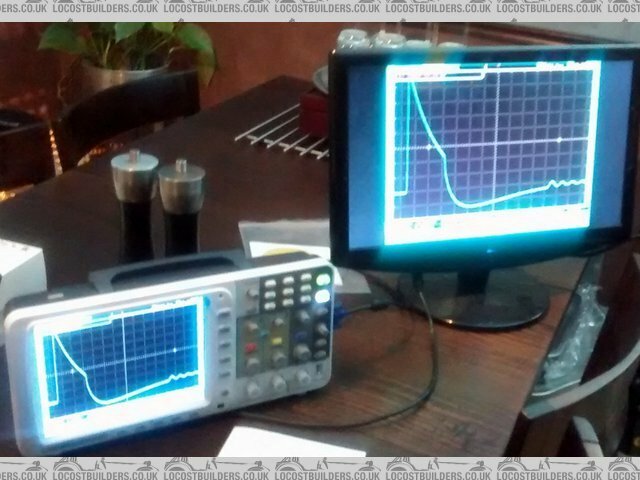 If you are a DIY mechanic or are small shop just wanting see what an Oscilloscope can do for you there are scopes on the market that won’t break the bank and let you learn about using a scope or perhaps diagnose a hard to pin down fault. I had used old style scopes before to measure spark plug voltage but what really convinced me a scope was a go to tool was tracking down an ABS fault on car with active wheel bearings. The two main very low cost options sold for automotive work are the Hantek 1008C and the AESwave UScope. The Hantek is USB scope that requires a connection to a Windows computer, the AESwave is a tiny handheld unit the size of a small mp3 player. The Hantek 1008C is remarkably cheap it comes bundled with a few handy leads and a DIS ignition probe. It has 8 channels (!) with BNC connectors in reality it isn’t useable as an 8 channel scope because the signal processing is shared between all the channels. To get useable capture speed don’t expect to get useful work out of it with more than 2 or at very most 3 channels turned on. 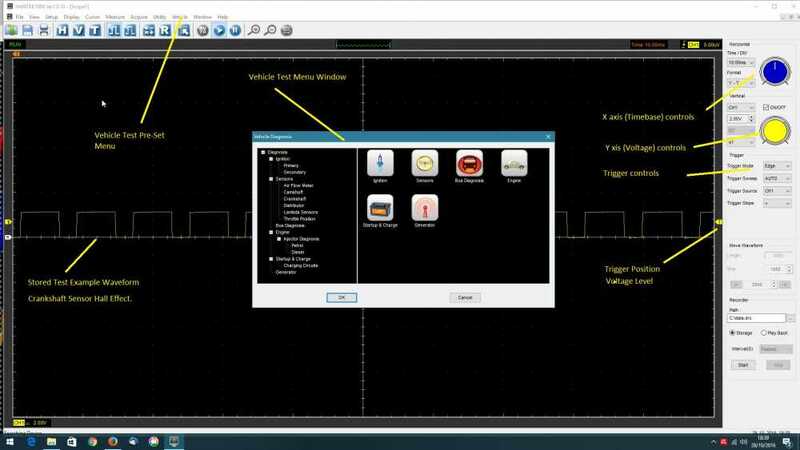 Like most Chinese made scopes I have used the Windows software leaves a lot to be desired it is tedious to use but it has a menu that offers pre-sets for most automotive tests and Y scale settings for most automotive probes. A quirk of the software is by default it installs in the Cantonese Chinese language, this can be fixed by simply deleting the Chinese language files after which it defaults to US English. The Hantek 1008C only differs from the 1008B model in the probes bundled with the scope. The Hantek’s hardware is perhaps not the best quality and it lacks an AC setting and any built in filters but it can produce some fairly decent captures. The AESwave Uscope is a tiny cell phone sized scope the hardware is based on another Chinese scope (the DSO201 Nano) the major difference is the built in software (firmware). The original DSO201 Nano looks identical but is just about unusable with the original firmware, but the AESwave firmware transforms it into a very useful little tool. Paul has made a couple of videos using it for diagnosing misfires I have one, (actually mine is a DSO201 with a different freeware firmware loaded) and because of its small size it is my tool of choice for checking speed sensor signals or other jobs under the car. The excellent AESwave firmware is custom made for automotive work and is well worth the few extra dollars particular if you are a new comer to using a scope. If you live outside North America as shipping and customs charges make buying tool from the USA less attractive. The basic DSO201 Nano sold on eBay can be made useable by upgrading using the free Ben-F Firmware but it will lack many of the specialist automotive features found in the AESwave. The process for upgrading the firmware is very similar to loading a custom ROM on an Android phone, so it is slightly “techie”process and not for the faint hearted also you have to make sure the version of Ben-F firmware is suitable for the hardware version. In cylinder Pressure test taken wit DSO201 Nano running Ben-F firmware and home built sensor. Last edit: 29 Oct 2016 07:07 by Andy.MacFadyen. Given the fact that budgets are a relative term, I though I'd add my two cents here. I bought my first scope last year. I was planning on buying a Uscope. I liked the size, the price, and the features. I was however, concerned with the fact that it only had one channel. I figured that I’d wait till a two channel version of the Uscope came out and buy that. However, it became apparent that AES had no plans for a two channel version. Upon the recommendation of a popular diagnostician on YT and even Paul Danner himself, I bought a used, but like new, Snap-On Vantage Pro. It had somewhat older firmware but since my newest car is a 2009 the coverage was fine. The cost was twice that of a Uscope but I got a two channel scope and the famous Snap-On troubleshooter as well. To me, this was a smart financial decision and I am 100% satisfied with it. I just completed a rather challenging engine swap and without the Vantage Pro I never would have been able to troubleshoot any of the suspected problem systems. Despite the fact that it cost me twice the price of a Uscope, it easily cost justified itself during this swap. There are numerous good reasons to buy a used Vantage Pro. Here are what I see as the most important. First and foremost is the Snap-On component troubleshooter. Packed with information, the troubleshooter gives; troubleshooting procedures, component locations, pin outs, expected voltages and signals, sample waveforms, etc,. It makes use of an amp clamp a no brainer operation. 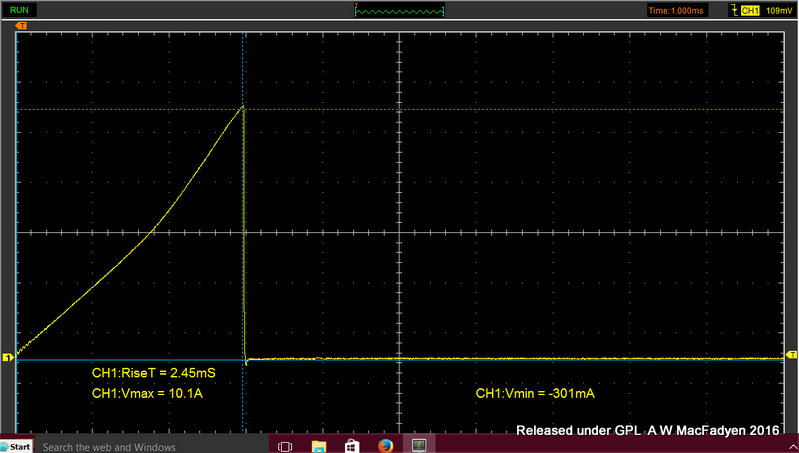 Secondly, and most relevant to this thread, is the fact that it is a 2 channel scope! I’ve used mine to do cam/crank correlations, O2 testing, injector testing, APP signal testing, relative compression, and several other things. Consider the fact that the Vantage Pro offers the component troubleshooter and the 2 channel scope it is my opinion that you’d be hard pressed to find a better limited budget scope option. Another consideration might be an older used Modis - 4 channels!! If your personal budget is such that a Vantage Pro is something you can consider, I say go for it! Prices will vary based on update version and condition. Used Vantage Pros can be found on eBay and Craigslist. Last edit: 19 Jan 2017 15:04 by jcascel1. John I very much enjoyed your write up on the Vantage Pro it clearly was obviously 100% a great buy for you. A two channel scope can do jobs that just aren't possible with a single channel. The Vantage Pro is also small enough to use in tight corners such as under the dash where using virtual PC based scope like a Hantek or a Picoscope wouldn't be easy. 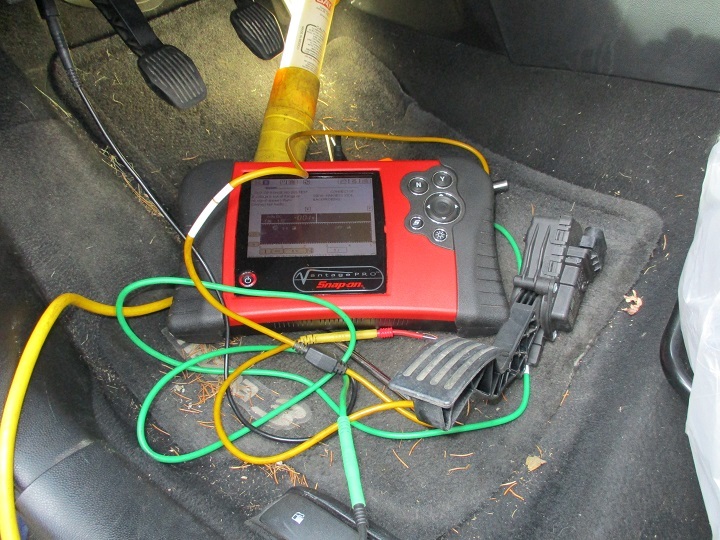 Outside North America although they sell a lot of hand tools Snap-On's diagnostic tools are not so widely used so finding a used Vantage Pro at a good price could be more challenging. I should write a review on the other scopes I have used recently the Velleman WFS210 and my Owon SDS7102v but the thread started by Tyler on Testing Injectors using a knock sensor has used up my play time. The in-cylinder pressure tester was quite simple and cheap to build istr I wrote it up in the old Scanndanner forum since them I added a couple of refiments so I will rework it and post it again. I also built a Firstlook style pressure pulse sensor using a contact microphone and a plastic Mustard bottle. The Vantage Pro is also small enough to use in tight corners such as under the dash where using virtual PC based scope like a Hantek or a Picoscope wouldn't be easy. I certainly do agree with that! I should write a review on the other scopes I have used recently the Velleman WFS210 and my Owon SDS7102v……….. There certainly are numerous options out there! …..but the thread started by Tyler on Testing Injectors using a knock sensor has used up my play time. That sounds like an interesting project, I’ll have to search the threads for it. The in-cylinder pressure tester was quite simple and cheap to build I wrote it up in the old Scanndanner forum since them I added a couple of refiments so I will rework it and post it again. Just got my Vantage Pro updated to the latest (and last) version 16.4 on Wednesday. It will take me thru 2015 autos. Bought the scope in primo condition on ebay for $750 and it came with the low amp probe a few months ago. It is my entry level scope and I think I made the right choice with my inexperience. The update did cost over $400. But it will fit my needs (combined with my Autoengenutiy scanner) for several years at a bare minimum. The fact is, the capabilities of the scope itself will never (in my lifetime) be obsolete. I just won't have the Snap On Troubleshooter capabilities being laid out on the screen for autos past 2015. But the meat of the tool will always be there I believe. rockp2 wrote: Just got my Vantage Pro updated to the latest (and last) version 16.4 on Wednesday. It will take me thru 2015 autos. Bought the scope in primo condition on ebay for $750 and it came with the low amp probe a few months ago. It is my entry level scope and I think I made the right choice with my inexperience. The update did cost over $400. But it will fit my needs (combined with my Autoengenutiy scanner) for several years at a bare minimum. The fact is, the capabilities of the scope itself will never (in my lifetime) be obsolete. I just won't have the Snap On Troubleshooter capabilities being laid out on the screen for autos past 2015. But the meat of the tool will always be there I believe. I still use my old Vantage MT2400 when I don't really "need" to bust out the Verus and that hasn't had any relevant repair info since 1999! I recommend you guys check out the Vantage Pro training series on ScannerDanner Premium if you haven't already. Last edit: 20 Jan 2017 18:21 by Noah. Last edit: 20 Jan 2017 19:19 by rockp2. Same here but I watched Pauls, and every other one I could find, before I even bought the tool since that was how I made my final decision to buy it. If it's good enough for Paul, well then, it's surely good enough for this DIY'er! Congrats on the new Vantage and the sweet new update. You're definitely set for a while! I suspect that this forum has a majority of users who are either experienced technicians or who work in the field and require reasonably high levels of hardware/software ability. Comments and suggestions may reflect that. Might be wrong. Me? I am a self taught home hack who only repairs his and relatives cars. I have a reasonable level of automotive electrical knowledge (I designed and installed the wiring system for my race car) but have had my eyes opened to the world of diagnostics by watching Paul's excellent YouTube videos. I have bought his "book" and am considering signing up to his paid YouTube channel. However, unless I have a scope I feel that his teachings cannot be fully put into practice. Here's my problem. I would probably only need a scope once or twice a year. My current low level of experience says that I only need a basic scope (2 channel) and an assortment of leads. As does anybody, I need a scope that is accurate. I need a scope that shows an appropriate level of detail (hmmm until I start playing I perhaps don't even know what this is!). In Australia, 2nd hand Snap-On stuff is like hen's teeth and even if available is TOTALLY out of my price range so don't bother going there. A new Picoscope 2 channel standard kit runs to AUD$2,500 (or about 1,800 of your George Washingtons) and is again TOTALLY out of my price range. 2nd hand do not exist. Given my level of usage I would find it hard to spend more than AUD$500 (US$380) or so. Yes I know this is a pitifully low figure but wife and kids come first before my play toys! That's just life. As far as I have been able to research, there are definitely no tools with a built in screen in my price range (new or 2nd hand). This leaves USB devices. I love the look of the Picoscope and it appears to be great quality (the great man himself uses one) but as I say even the unit itself with no leads is over my price range. This pretty much leaves one of the Hantek devices that are comparatively DIRT CHEAP. Have read varying reviews but it seems to be within my grasp. Agree/disagree?? Andy.FcFadyen seems to like them - any association with the brand? For the uneducated like myself, trying to work out exactly which model I need is almost impossible. Bandwidth?? Refresh rates?? Memory?? Verticle resolution?????? Strewth I'm not even on Facebook yet (and never will be ). Can somebody provide some advice as to which model(s) may be suitable???? Take into account that this is required to cover 99% of diagnostics that a home mechanic needs to do and abviously needs a suitable level or accurancy and detail. I'm also a DIY'er and although Andy MacFadyen provided excellent information, I will throw in my thoughts, for what it's worth. I am a firm believer in: "you get what you pay for" but I too have a family to support and since car repair is just a necessity / hobby, it falls very low on the priority list when it comes to spending money. I bought the uScope (master kit: $400 US) (basic: $154 US) last year from AESWave.com and have been very happy with it, although it has been a long slow learning process. I have found that as a newbie to the scope world, it has been difficult to locate good comprehensive training sources. AESWave provides some uScope videos, and they are helpful, but they seem to be directed towards users that are already familiar with scopes. I ordered the book "Advanced Lab Scope Voltage & Current Testing" from them earlier this week, so hopefully that will help me learn. The main reason I chose the uScope is the support I could receive from AESWave, if needed. If I were in your shoes, the costs associated with purchasing that scope from outside the US might be enough to steer me away from the uScope and towards the Hantek or DSO201 scopes that Andy refers to. I knew when I bought mine that I would someday need to buy a scope with at least 2 channels. That day has not yet arrived but when it does, I might just pay a mechanic to diagnose the vehicle at that point. Last edit: 01 Apr 2017 21:15 by gimmick1. Reason: Removed a link that didn't add much to the discussion. My first scope was a Hantek 1008C I bought on eBay for $48. You can buy them new for about $100. You will spend way more than that on the probes, leads, and accessories that are need to make the scope useful. These items are necessary no matter what scope you use. But they can still be used if you choose to upgrade to a better scope in the future. Scannerdanner has plenty of information on how to use the scope that applies across the board to most any other scope. Bottom line is, any scope is better than no scope, but if you can afford it get a Pico. Scopes are only difficult to use until you play about with one. After a couple of hours the sky is the limit. One of the problems with recommending a scope is that shipping, customs duties and local taxes can make a huge difference in cost between continents. Keep in mind although Pico and Snap-On have excellent hardware most of the price premium for these scopes is due to the time and money they pour into software development to make automotive tests simpler for the user. The Hantek 1008 is the cheapest of the cheap and quality is very "iffy", but if you stick to using only 1 or 2 channels the hardware is good enough for decent captures but like most Chineses scopes the software interface is awful but has the saving graces of pre-configured automotive tests which by-pass a lot of the chore of setting up using the interface and make it a lot easier for the beginner. It also comes with a good selection of probes and connectors which if you bought individually would almost equal the cost of the scope. It is a USB scope so is tied to using wth a Laptop or PC which might not be the easiest thing in a the paddock of a race track. In short a lot of bang for your buck, it will do useful work good to learn on but ultimately frustrating. Hantek have some new more upmarket automotive models, the hardware looks better but the software interface is unchanged. The DSO204 is an upgraded version of the DSO204 faster with 2 usable analog channels (nb. 2 analog channels + 2 logic channels) the firmware appears based on Paul's Firmware so should be good. These DSO Nano scopes like the uScope fit in your pocket to are ideal for taking to race meeting. I have run out of time I will add more on this topic in a few hours. Last edit: 27 Feb 2017 03:16 by Andy.MacFadyen. I recently saw an OTC Pegisys handheld scope/scanner for sale on a reputible auction site. Never heard of them before so I started to research. As far as I can tell this is both a scope AND a scanner. I would assume it's scanning ability is limited to reading generic codes and would not contain the necessary software to interogate specific car systems? I did see a training video on YouTube that showed a whole number of car brand symbols so maybe I am wrong on the generic only thing? As a scope, would something like this do pretty much everything that a 2 channel USB scope does? The screen is not as big but looks fine. I think these also allow connection to an internet site to get specific car help information such as component voltages/frequencies and also help with fixes and wiring diagrams. I would assume there would be a yearly fee to access something like that? Being in Australia, if I went down this handheld option, I would need something that had good European and Asian car info as US domestic cars are not sold here other than a few Jeeps. Would seem that this one is 'similar' to some of the Snap On diagnostic tools? Not sure what issues would exist with firmware updates (cost, availability) or with content updates (again cost and if it is even supported still)? I really like using this scope I can get up and running a grab a decent capure fairly quickly, but it isn't designed for car work and while it suits me it won't suit everybody. The battery life between charges was never as good as expected and after a years use it has died completely. When I bought the scope I was offered a special deal on the battery and bag bundle and I suspect the seller was off-loading a suspect load of batteries. As a replacement battery is fairly costly at £60 I am reluctant to commit to buying a replacement which may suffer the same short life as the original, in the interim I am continuing to use the scope on 230v power. I am very tempted to buy a new scope a Carscope Viso. Real not virtual knobs, automatic setup, decent memory, excellent built-in software filters, USB ports for Flash Disk and PC connection, VGA port for connection. Labscope not specialist Automotive Scope, Fairly bulky, Disapointing battery life between recharges, 230v mains power, battery has died after 1 years use. Channel 1 trace is difficult to see in bright sun light, Owon's PC software interface is not good. Last edit: 11 Mar 2017 05:41 by Andy.MacFadyen. you should add the picoscope 2204a to your options.. in the USA it cost about 140 usd but only come with the standard lab probes, you will spend more with the accessories specific to automotive use, this is the general purpose oscilloscope, not the automotive version, but in reality you don't need the automotive version to make measurements, the automotive ones just sometimes makes your life easier by including presets configuration for different sensors. The advantage of the picoscope is the software, it uses the same software for all their scopes, from this 140 usd to the several thousand dollars versions. As a word of advice if you get this scope, get the external attenuators because it is only rated to +- 20V with a x1 input, with an x10 attenuator you can extend that range to +-200V.